The brambles have bounced back nicely from last year’s drought with pink blooms beckoning pollinators of all kinds. It won’t be long before we’ll have to dust off that blackberry cobbler recipe. Bumble bee does buzz pollination. Honey bee looks like she’s got shades. Wasp carrying yellow pollen pellets on his legs. “It is rather for us to be here dedicated to the great task remaining before us— that from these honored dead we take increased devotion to that cause for which they gave the last full measure of devotion — that we here highly resolve that these dead shall not have died in vain — that this nation, under God, shall have a new birth of freedom — and that government of the people, by the people, for the people, shall not perish from the earth.” — Abraham Lincoln. 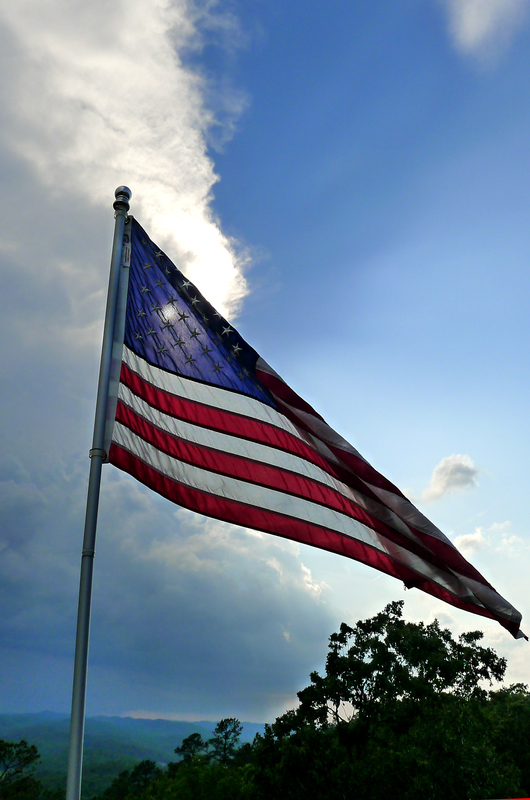 Old Glory waves in the face of an approaching storm. It’s that time of year again. The sound of “chip, chip, chip,” followed a series of thunks and talon scratchings against the front door and the bedroom windows. Claudia Cardinal(e) is back defending her territory to the south and the Mr. Indigo Bunting is doing the same on the north side of the house. This fellow likes to find the highest branches in which to sing his songs. 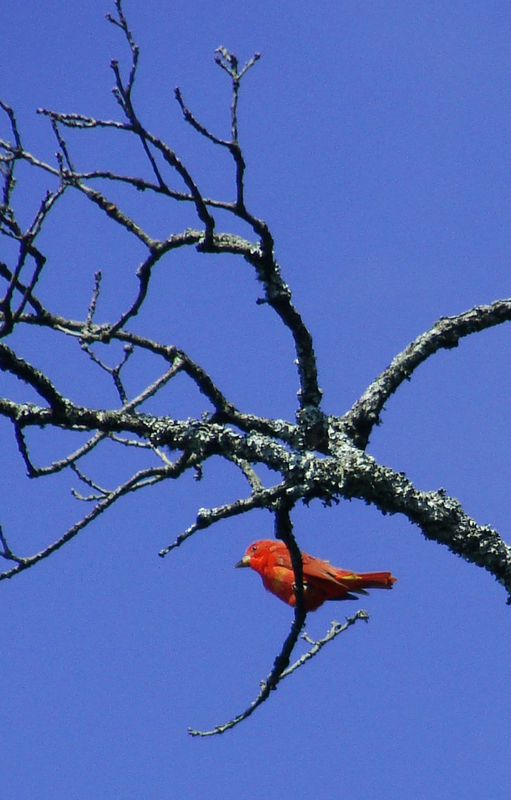 Red summer tanager in the leafless upper branches of a troubled oak tree. Uh oh! Less than 10 percent of our space left in WordPress. Time for an upgrade. 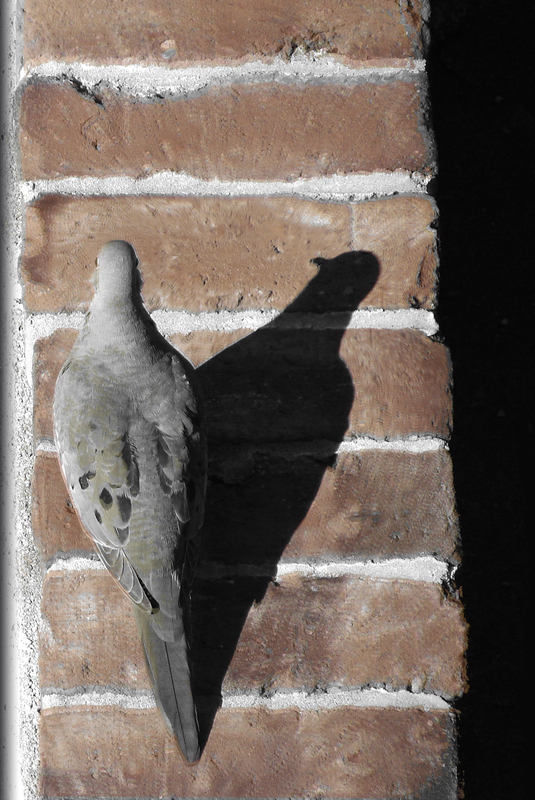 Mourning dove and his shadow, made pseudo-stereoscopic by some dang-it-why-didn’t-I-do-this-right-the-first-time Photoshoppery. Sunburn, bratwurst and what sounded like very large, very angry bees all added up to Sunday of being smitten by the motor sports bug. It was a blast watching drivers of all skill levels and cars of all wallet sizes careen around orange cones in the parking lot of War Memorial Stadium trying to best their last timed lap. There were daily drivers — sedans and station wagons with blue masking tape numbers on the side. There were other vehicles whose owners had invested in high-end engines, exhausts, spoilers, paint jobs and other modifications. The atmosphere was very laid back, and if there were any drivers’ excuses, we were too far away to hear them. 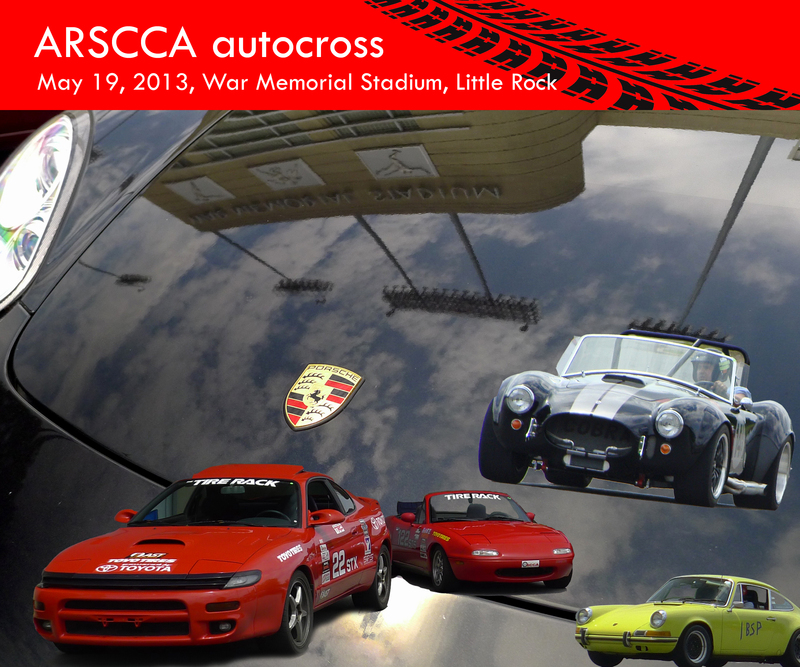 The autocross was put on by the Sports Car Club of America’s Arkansas affiliate. Maybe some day we’ll get to see the race from inside the windshield. Nature continues to be generous on the mountain. Hop clover and primrose bud. Tight shot of the center of an evening primrose bloom. Reaching for a ladle from the pot rack to make some weekend breakfast crepes. 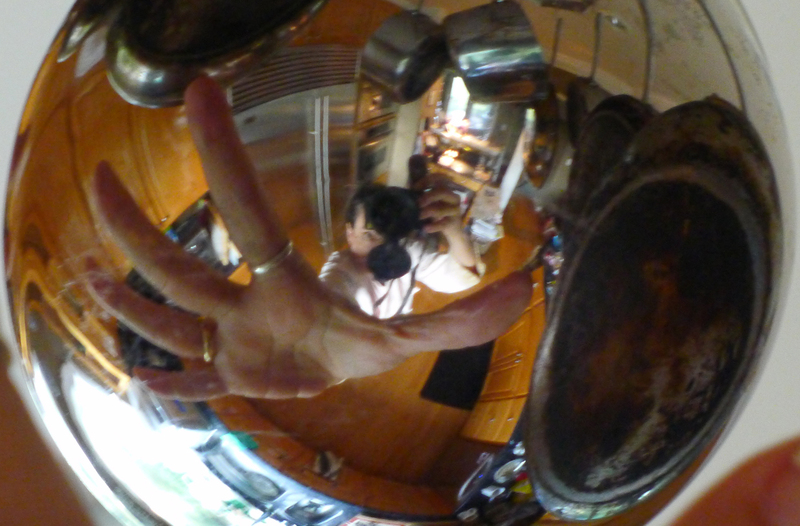 Reflected in the steel bowl of a ladle. 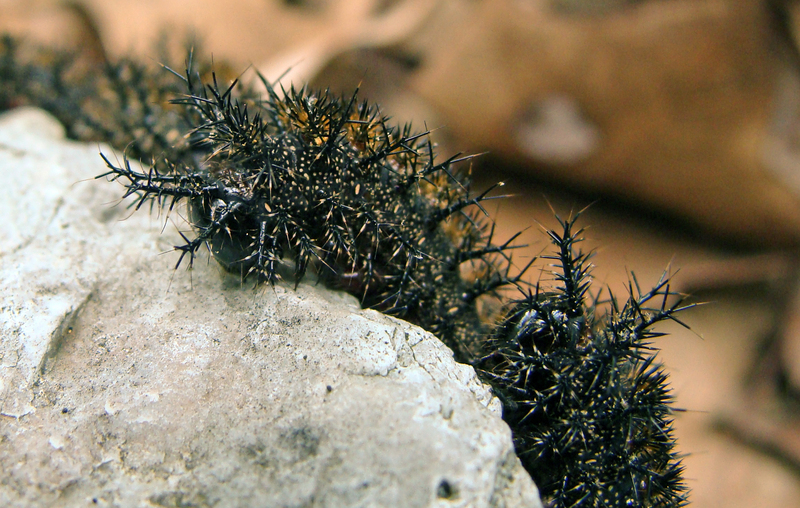 “If I could just make it over the top of this rock … escape is in sight!” — Quoth the spiny caterpillar. Thanks to our friendly neighborhood extension urban entomologist for the ID on this fellow and his kin: the Eastern Buck moth, Hemileuca maia. Yet another update — It seems we’ve got this whole escape thing backwards where the buck moth caterpillar is concerned. 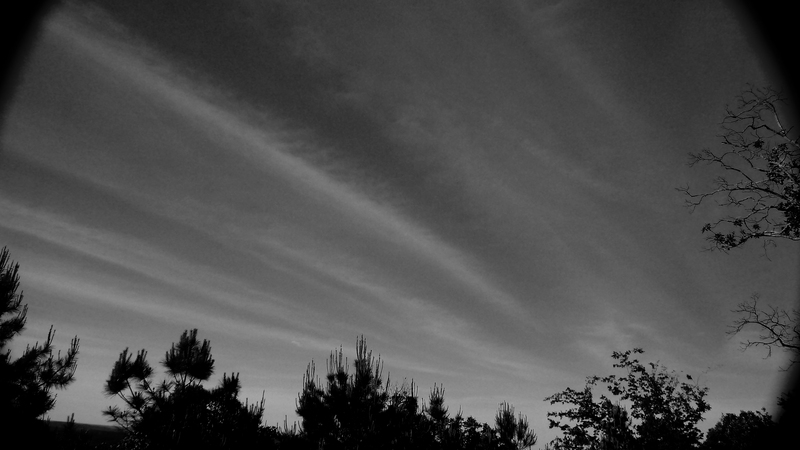 See “Look, but don’t touch, buck moth caterpillars.” Run away! Single caterpillar tries to make a break up and over a rock. 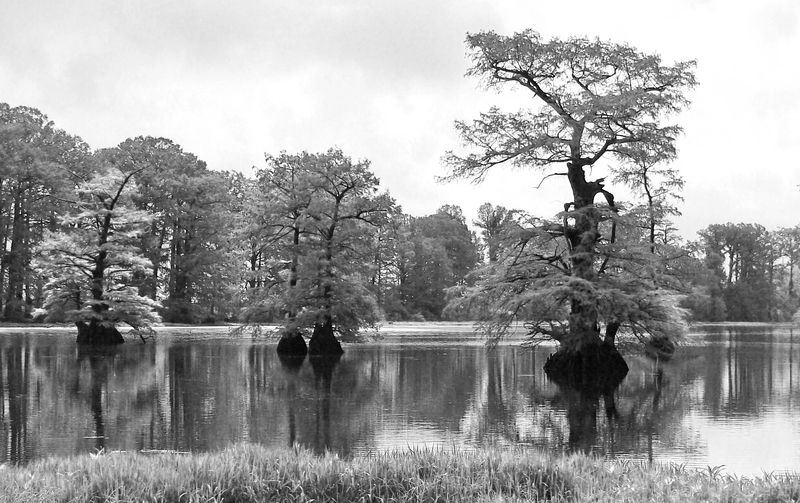 One face of the rock in the woods was covered with scores of other spiny brethren.